Going off the beaten trail for the weekend with a couple of mates can be one of the best experiences in the world. As fun as driving around in your 4×4 is throughout the day, things can get slower when night falls and you have to set up camp. In order to make drinking and unwinding more pleasant, you’ll want to participate in some leisure activities, like listening to music, playing some games on the laptop, or just watching the game on the TV. That being said, you’ll need a source for electricity, which could be provided by your vehicle’s battery. But why risk draining the battery when you’re in the middle of nowhere? For that reason, you should consider investing in leisure batteries. There are many different types of leisure batteries, but all of them fall into two main categories – wet and non-wet batteries. For off-road driving where there’s a likelihood of your 4×4 tipping over, non-wet batteries are the preferred option. There are a few different types of non-wet leisure batteries, including gel batteries, AGM batteries and lithium batteries. Without further ado, let’s get into detail about each type of battery and how they differ from one another so that you can make an informed buying decision. While most wet batteries contain corrosive acid which can cause personal injury in case of inversion, gel batteries, as their name implies, feature a gel that’s a non-spill electrolyte in a completely sealed casing. Even though these batteries won’t perform as good as wet-acid batteries, the extra safety they provide is much more important when driving in rough conditions. When recharging gel batteries, ensure the charge voltage doesn’t exceed 14.2V. 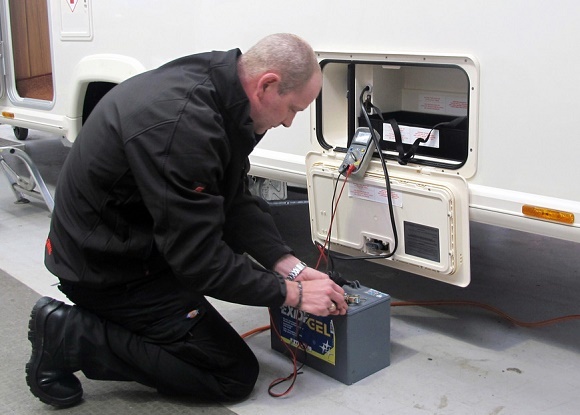 AGM batteries, also known as absorbent glass mat batteries feature lead plates in each cell, and highly compressed glass fibre is added into each compartment. The fibre absorbs the electrolyte, then excess air is drawn from the casing and a pressure relief valve is equipped. This process is complicated, which is why AGM batteries cost more than gel batteries. However, AGM batteries usually achieve more recharging cycles, meaning they have a longer working life. An important feature these batteries have is that they can also act as starter batteries. When recharging AGM batteries, ensure the charge voltage doesn’t exceed 14.4V. Lithium iron phosphate batteries are self-contained units that feature their own on-board charge manager. Due to the fact that they don’t feature any lead, they weigh significantly less than lead-acid batteries, and they can be fully recharged and discharged. During their discharge cycle, they are capable of retaining stable voltage levels, and they can be recharged very rapidly. The main issue with lithium batteries is their price, which can be 5 times higher than the cost of other types of batteries.